Development of realistic radar bomb scoring opened up new vistas for bomber effectiveness. Success in wartime depends heavily on proper training in peacetime. In pre-World War II training drills, B-17 bomber crews with Norden bombsights could drop bombs into a “pickle barrel” some 25,000 feet below. The skies were clear, targets were visible, and bombers were unmolested by defenders. However, this was unrealistic. In actual combat over Germany, bombing accuracy was often abysmal, and no wonder. Faced with cloudy European skies, smoke-shrouded targets, enemy flak, and air defense fighters, America’s incoming bombers often were unable to see the ground or pick a target out of the clutter below. After World War II, the Air Force mission list grew to include delivery of nuclear weapons on the Soviet Union. Masses of heavy bombers no longer would be required to attack. Against the Soviet homeland, single bombers armed with a nuclear weapon were powerful enough to destroy specific targets. Air Force planners did not contemplate fighting a war of gradual escalation against Moscow. Instead, they envisioned a war in which USAF would mount one overwhelming, simultaneous “Sunday punch” attack on all designated targets from the outset of hostilities. All combat crews, not just a select few, had to be capable of finding and destroying assigned targets at any given time. The consequences of this fact were far-reaching. B-17s fly over Neumunster, Germany, on April 8, 1945. The means to carry out realistic radar bombing training was developed at the end of the war. An experimental radar station in Jacksonville, Fla., proved that bombing missions could be run against specific targets with the projected impact point of the bomb accurately plotted. The success of the experimental site at Jacksonville led directly to the establishment of radar bomb scoring (RBS) sites near five other cities—Fort Worth, Tex., Kansas City, Mo., Albuquerque, N.M., Los Angeles, and Omaha, Neb. With these sites in operation, it became possible to conduct realistic but economical bombing training in peacetime. Strategic Air Command was created in 1946. During its first year of existence, SAC crews made 880 bomber runs specifically for the purpose of radar scoring. SAC was in rough shape: Morale was low, maintenance and crew readiness were poor, and SAC bombing was deplorably inaccurate. On April 30, 1948, Vandenberg, by then a four-star general, was named Chief of Staff of the Air Force. Vandenberg soon asked retired Col. Charles A. Lindbergh, the pioneering aviator, to survey all aspects of SAC operations and propose ways to boost the command’s combat readiness. Once he had completed his survey, Lindbergh produced a lengthy list of ways to improve things. He suggested recognizing crew duty as a career field; emphasizing crew integrity; reducing the training of crew members to perform other duties (i.e. pilot, navigator, bombardier, radar operator, and flight engineer duties); more realistic peacetime bombing missions; and improving living conditions for SAC personnel. Lindbergh’s recommendations were avidly embraced by SAC’s second commander in chief, Gen. Curtis E. LeMay, who took command in October 1948. Three months after his elevation, LeMay ordered a mock generation of the entire command for the purpose of mounting a simulated bomb attack in the vicinity of Wright-Patterson AFB, Ohio. 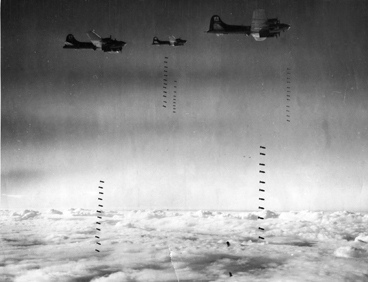 The bombing results were extremely poor, with an average bombing error of 10,900 feet. LeMay was determined to correct this shortcoming. He directed the establishment of a combat crew training school whose purpose was to train lead crews that would then train others. All crews other than lead crews were required to fly several radar bombing missions a week. Training became more realistic with the addition of combat breakaways and electronic countermeasure jamming. In 1948, SAC crews turned in more than 12,000 radar bomb scoring training runs. The next year saw the number of RBS events rise to 28,049, or an average of about 76 runs per day. As a result of this new emphasis on realistic, radar supported bomb practice, errors decreased in dramatic fashion. 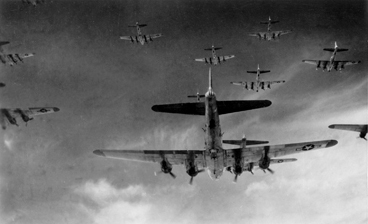 Over Europe, B-17s (pictured) often missed their marks because the attacking bombers had to contend with obscured targets and enemy attack. Radar bomb scoring eliminated the need to see the target. Soon came a test of the SAC force. On June 25, 1950, communist North Korea invaded South Korea, suddenly thrusting SAC crews—which had trained principally for atomic war—into a fast-moving conventional conflict featuring World War II-style daylight formation-bombing tactics. Even so, SAC bombers quickly destroyed all the North Korean strategic targets, and, in October, two B-29 groups were sent home while two other Stateside groups remained in the Far East. In August, three bomb scoring detachments arrived in Korea, and soon they were in Pyongyang directing American attacks against Chinese forces that had entered the war. Following the withdrawal of UN forces from the North in early 1951, RBS detachments were assigned to each of the three Army corps, where they directed bomb drops in support of tactical forces. These detachments guided the bomb drops of all of the military aircraft arrayed along the line of conflict. The ground-based radars would pick up the incoming bombers, and controllers would use landmarks to “talk” pilots to their bomb-release points. These RBS-directed drops were critically important in helping to turn back the Chinese attacks against Heartbreak Ridge and the Punch Bowl while the armistice talks were going on. Following the end of combat in Korea, SAC expanded once again, and, by 1964, the command’s striking force consisted of 1,111 bombers and 831 intercontinental ballistic missiles. For well over a decade, SAC trained for a nuclear war, but soon it was directed to provide conventional bombing support in South Vietnam. Once again, there was no relationship between SAC’s regular peacetime training and what it was directed to do in combat. Initially, B-52s were used to bomb suspected Viet Cong jungle bases in South Vietnam. The rain of bombs from the B-52s devastated the countryside and led to the bombers being called “Monkey Killers” and “Toothpick Makers.” To hit a target, the B-52 required an identifiable aiming point. Unfortunately, in South Vietnam, there were only a few readily identifiable aiming points in the jungle. When they lacked natural aiming points, the B-52s often would turn to what was called an “offset aiming point,” or OAP. An OAP was a nearby, clearly identifiable point that could be used for synchronization. Distance and direction from the OAP to a target would be set in the bombing computer—the run would be made on the aiming point, and the bombs would fall on the target. A low-powered radar beacon on a known location also could be used as an OAP in the absence of any identifiable targets. The mission of the RBS sites changed during Vietnam as the purpose evolved from scoring bomb runs to directing aircraft bomb drops even when visual reference points were not available. Doing this required a reversal of the training process. Radar was used to track a bomber’s position relative to a desired release point. Ground controllers could direct the aircraft and order weapons release even if the crew had no view of the landscape or the target. Accuracy was much improved, even compared to the RBS operations in Korea. In Vietnam, new radar systems allowed fighters without ground target acquisition radars, such as this F-100, to accurately provide air support. Sky Spot would track the attack aircraft’s position relative to a desired release point. By 1967, the Air Force deployed to South Vietnam and Thailand six RBS sites called Sky Spots, each equipped with MSQ-77 radars. These sites provided RBS coverage over all of South Vietnam, the eastern part of Cambodia, southern Laos, and the southern part of North Vietnam. Sky Spot could accurately direct bomb drops against targets at a distance of 200 miles. The sites were critically important in directing strikes at night, in inclement weather, and in support of Special Forces camps and friendly outposts. Sky Spot was at times the only means of providing air support to friendly forces under attack. In adverse weather, F-4s, F-100s, and A-4s, none of which had a ground target acquisition radar, had to rely on Sky Spot to get the kind of information they needed to hit their targets. 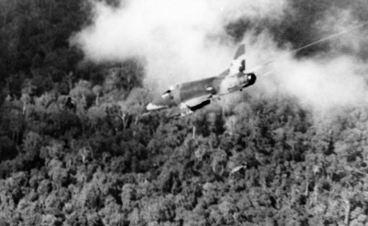 The F-105s and F-4s that flew over North Vietnam also lacked an all-weather bombing capability, and, as a result, the North could not be bombed with any degree of accuracy during the monsoon season. To overcome this shortcoming, Gen. Hunter Harris Jr., Pacific Air Forces commander, obtained permission to install a TSQ-81 radar (a transportable version of the MSQ-77) in Laos. During the 1968 Tet Offensive, the communist forces sought to inflict a Dien Bien Phu-style defeat on the Marine garrison at Khe Sanh. The inclement weather favored the NV in their quest. Sky Spot, in coordination with the B-52s, helped prevent the North Vietnamese Army from achieving its goal. Initially, B-52 crews were not allowed to drop bombs within 3,000 yards of any friendly force. Sky Spot allowed the Air Force to shrink this margin of safety to 300 yards. B-52s flew 2,548 sorties and dropped 54,000 tons of explosives on the North Vietnamese forces that surrounded the marines. In an address to 3rd Air Division personnel on Guam, Army Gen. William C. Westmoreland, commander of forces in Vietnam, stated, “The thing that broke their back, basically, was the fire of the B-52s.” Those giant bombers were greatly aided by Sky Spot. In the spring of 1972, North Vietnam hoped to achieve a major military victory over the South by attacking Quang Tri and Kontum Provinces. Once again the B-52 was called on to provide close air support. Gen. John W. Vogt Jr., 7th Air Force commander, stated that the B-52 was “absolutely central” to the successful defense efforts against the invading forces. He added that its massive firepower “made the difference” in such key areas as An Loc and Kontum. As at Khe Sanh, it was the coordinated efforts of B-52s aided by Sky Spot targeting that provided the big stick. Following the failure of the North Vietnamese invasion of the South in the spring of 1972, President Nixon hoped that peace talks might be rapidly concluded. However, he recognized that Hanoi might be more inclined to protract the talks rather than end them. In August, a B-52 escorted by F-4 Phantoms flew a radar reconnaissance mission over Hanoi. The mission was to obtain radar footage of suitable aiming points that would be used in a bombing campaign against the military targets around the capital city. The Linebacker II campaign kicked off on Dec. 18, 1972. Three bombers were lost on the first day. (See “Linebacker II,” ) All went well the second day. On the third day, two B-52Ds and four B-52Gs were shot down, and other B-52s were severely damaged. 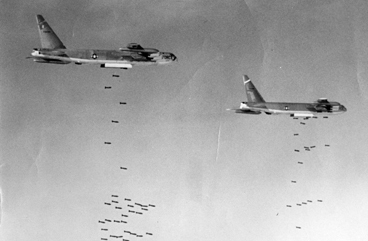 The predictable bomber stream made the B-52s sitting ducks for the North Vietnamese SAMs. On the fourth day, tactics were changed. Hanoi would be attacked from all directions at once, with greater use of chaff and including more supporting tactical aircraft. The changes brought success. Despite defects in mission planning, the bombing results were spectacularly successful. The aiming points identified as a result of the August reconnaissance mission enabled the B-52 bombardiers to find and hit their assigned targets. Collateral damage was held to a minimum. 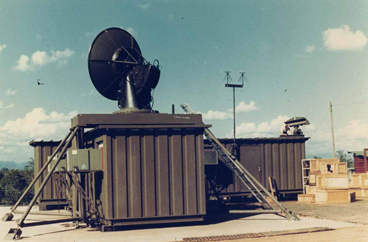 Transportable TSQ-81 systems provided radar tracking coverage over the Hanoi area. This allowed B-52s (above) to accurately strike targets and minimize collateral damage by flying to specific bomb drop locations. The shortcomings revealed during Linebacker II partly led to establishment of the Red Flag training program, the objective of which was to provide greater realism to peacetime training. Brig. Gen. James R. McCarthy (now retired), who served as a B-52 mission commander in Linebacker II, later judged a low-level B-52 Red Flag mission as being 75 percent realistic. That peacetime preparation is a far cry from what it used to be, and the shift toward realistic training tactics all began with radar bomb scoring after World War II. Sigmund Alexander, a retired colonel, is a former B-47 navigator and past president of the B-47 Stratojet Association. This is his first article for Air Force Magazine. Copyright Air Force Association. All rights reserved.